It’s that time of year, with Black Friday and Cyber Monday behind us, and Christmas fast approaching, that the mind turns to gifts. Whether it be buying for a techy loved one, looking for inspiration for that letter to Santa, or simply looking to spend a holiday gift card, there are a myriad of reasons to be browsing the web or stalking the aisles of your local electronics emporium. To create some food for thought, I have assembled a few ideas for you – products I have either been reviewing for MyMac Magazine or that I have bought for myself over the last twelve months. 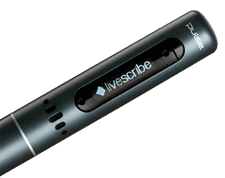 An truly amazing piece of technology, the Livescribe Pulse Smartpen is capable of recording everything you write and hear during a meeting or class. The pen contains a fully functioning computer, and uses a special faint dot pattern on notebooks to track your writing. At the same time, a microphone records the audio in the room as you write – either using a microphone in the pen or a more advanced unit built into the supplied headphones. When you dock the pen, all of the information is passed up to a Mac application, and you see images of all of your notebooks. Click on any piece of writing, and you hear the associated audio from when it was written. You can also do the same with the actual written notebook, with the pen recalling the audio. This really brings your notes to life – and allows your Mac to preserve notes from anything you have ever written.¬†The pen can store 200 hours of audio, and incorporates a small but bright OLED screen for user interaction. This allows small applications to be run on the pen, using written or drawn input interacting with the program from the page. Examples available from Livescribe’s App Store include phrasebooks for travel, simple educational apps and games.¬†The paper is freely available for stores such as Target, or from Livescribe themselves – and if you have the right kind of colour laser printer you can even print your own.¬†In summary, the Livescribe Pulse is a fantastic solution for the regular note taker, either in business or studying. I hate traditional laptop coolers. Bulky, hard plastic things that often demand access to a USB port to drive a fan, I find them ugly and uncomfortable, and I’d rather use my MacBook Pro at a desk or straight on my lap, and deal with the heat output of Apple’s finest. At least, until I tried the Heatshift. 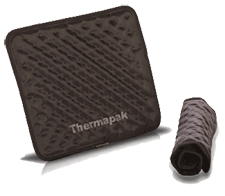 It’s a black flexible pad, with a dimpled top, and is filled with chemical crystals that soften as they warm. In doing do, they use the physical principle of phase change to direct heat away from the base of the laptop. It’s well thought through – the dimpled surface allows for air circulation, and the melting crystals prevent the laptop heat from reaching your legs, and make the pad a comfortable resting point for your machine. I’ve used the Heatshift for three to four hours without noticing a deterioration of the cooling effect, and once you remove it from the laptop the crystals regenerate on their own. Excellent. Eye-fi make SD memory cards for your camera with a very neat party trick – they also contain a full Wi-Fi adapter. Configure the card at first use in your Mac using the supplied software, and when you take pictures the card will log on to a Wi-Fi hotspot or your home network and upload the pictures to an online service of your choice – they support 25, including Flickr, Facebook, MobileMe & Evernote. You can choose which pictures get uploaded from the camera by using your camera’s delete protection feature – and picture so marked won’t be sent out over WiFi. I looked at the new Pro version of the card, that for the first time in the line-up support RAW images used by higher-end digital SLR cameras. RAW files are pretty big, so they don’t get sent up to Flickr – but if you set your camera to generate RAW+JPG files from each picture, the JPGs go to Flickr and the RAW files go to your Mac. The system will even use Skyhook Wireless technology to attempt to geotag your photos with a location on upload. If you are on holiday or at a family gathering, the photos you shoot will be made available to your friends and family very soon after you take them, removing the need for you to sit down and process them through iPhoto – and in my book, anything that saves you time is worth the money. We are all guilty of being a bit slipshod with data security. OSX comes with some great tools for securing data, such as encrypted disk images, but most of the time we don;t bother to use then – even on eminently losable or steal-able devices such as flash drives. Ironkey has built their business on solving this problem, through a set of flash drives that James Bond would be happy to store his little black book of beautiful agent conquests on. Ironkeys are metal flash drives, the electronics sealed in resin to make them tamperproof. The flash memory is protected by a separate cryptographic computer that bars access until the correct password is given – it will even destroy the data on the drive 10 or more incorrect password attempts are made. By using a hardware device, Ironkey ensures that the all-important cryptographic keys that protect your data are never held in memory, so can’t ever be compromised. This is much stronger than other encrypted drives on the market, which rely on a piece of software on the flash memory itself to unencrypt your data. They are available in sizes up to 32Gb, and come in two versions – with SLC Flash (like the one I tested) that has high-speed writing, or a D-series MLC Flash model that is cheaper but has slower write speeds. Just a caveat on this recommendation – the OS X support is limited to basic read/write access only. Many of the cooler features (such as a secure, portable version of Firefox for browsing) are only available on Windows, and you need Windows to get the drive set up when you start. So I recommend this only to users with access to a Windows machine – It is extremely well suited in an environment where you have Windows at work, and want to bring sensitive files home to your Mac for home working. I reviewed Seagate desktop and portable hard drives lat year, and gave them a high recommendation. Now Seagate has updated the range, and the 320Gb Freeagent Go for Mac is an even better product. The drive is light, thin and stylish, and very low in power consumption – I never needed to use anything other than a data cable to power it, though a USB power cable is packaged in case you ever need it. It has USB 2.0 and Firewire 800 ports on the chassis, and comes packed with the appropriate cables, including a Firewire 800 to 400 converter cable. It also comes with a Firewire 800 desktop dock that the drive vertically slots into, making it a good partner to a desktop machine, if it is a later model with a Firewire 800 port. I’m a strong believer that a quality branded product like this will be more satisfactory than a bare drive in a cheap enclosure, and the included accessories and five-year warranty from Seagate back that up in my view.